If you’ve owned a pet, then you know that he or she can become part of the family. But what are you supposed to do if you can no longer afford that family member? That’s where Pet Food Pantry of Oklahoma City comes in. 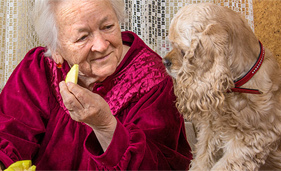 The Pet Food Pantry provides pet food and supplies to low-income pet owners. The nonprofit primarily works with homeless agencies and senior citizens throughout Norman, Oklahoma City, Edmond, Mustang, Yukon, Moore and Midwest City. Once a month, volunteers drive food and other pet supplies to those in need. These products come to the Pet Food Pantry through donations of money and pet food. Though the nonprofit gladly accepts any and all donations, sometimes money can help more people and pets overall. “I know people always come back to ‘give money, give money, give money,’ but the truth is we can buy pet food for cheaper than what they can buy it for,” Pempin said. With five dogs and four cats, Pempin has a soft spot for animals. She began Pet Food Pantry of Oklahoma City in June 2010 after meeting and learning about families who were struggling to take care of themselves and their pets. Pempin understands how important a pet can be to his or her owner, which is why this nonprofit will help people no matter what kind of pet they own. Pet Food Pantry is run almost completely by volunteers and has donation bins set up throughout the Oklahoma City area. Pempin said the nonprofit helps hundreds of animals each month. “I would like to say how blessed we are to have a community that really does support the pets of our community and the people that need their help in taking care of their pets,” Pempin said.